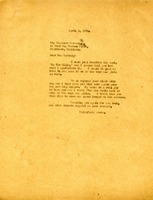 Letter to Theodore Marburg from Martha Berry thanking him for the book he sent entitled "Into the Hills." He informs him that she will share it with the boys and girls. She also informs him that she, along with the boys and girls, so enjoyed his visit to the schools and that she hopes he will come again and stay longer. She also sends regards to his brother.